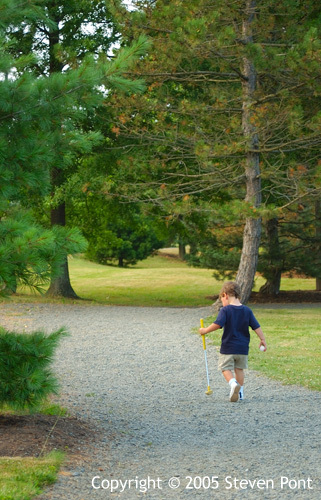 Walking to the 19th hole for a cold chocolate milk after a long day on the links. In honor of the recent release of Star Wars: Episode III: Revenge of the Sith, I offer this tribute featuring my son Michael, his friend Matthew, and some amateur rotoscoping by yours truly. 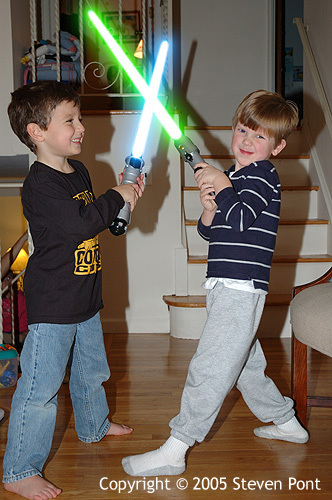 You might think that it is irresponsible of me to allow the boys to play with live light sabers in the house, but not to worry -- these were set in "practice mode", so they would only get a shock if contact was made, instead of having a limb cut off. Those Jedi think of everything. In case you are wondering how light sabers work, you can find out here. 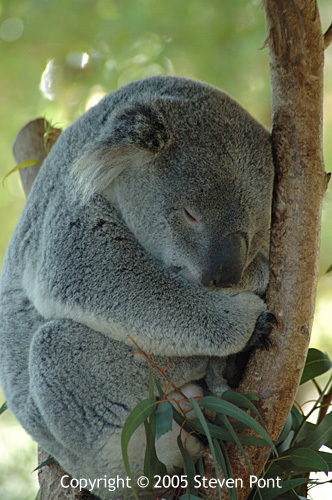 Whatever happened to those TV commercials for Qantas Airlines that used to be shown in the US? You can easily recognize successful advertising campaigns by the fact that you can remember both the ad and (more importantly from the perspective of the advertiser) the name of the product being sold many years later. 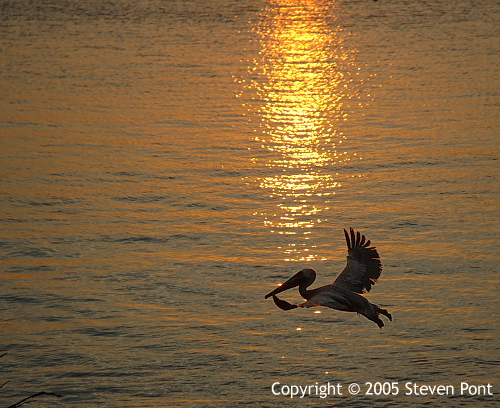 This is a pelican swooping in for a quick meal. At least I think it's a pelican. I'm not exactly a budding ornithologist, but this bird did remind me of Nigel from Disney's Finding Nemo. Now that I think of it, the book All I Really Need to Know I Learned in Kindergarten could probably be retitled "All I Really Need to Know I Learned from Watching Finding Nemo". There are valuable life lessons, excellent motivational strategies ("Just keep swimming, just keep swimming, just keep swimming, swimming, swimming"), and a great introduction to the world under the ocean. I can now pick out a clown fish at twenty paces and speak several dialects of whale. He sang bawdy songs and told off-color jokes. 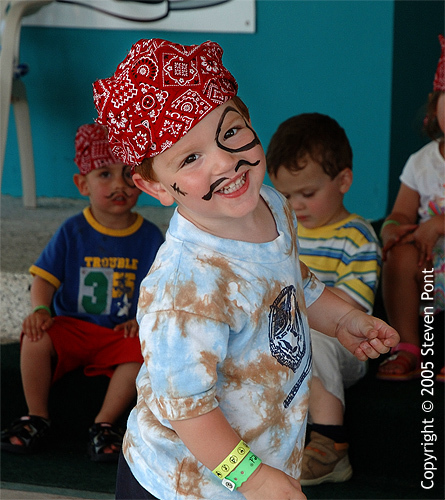 The only time he was happier was when he found a secret cache of lollipops. 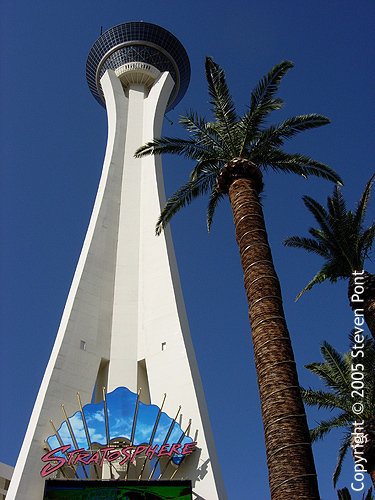 This is the Stratosphere Hotel in Las Vegas, NV. And yes, it is bigger than a tree. If you look closely at the top of the tower, you can see some stuff hanging off the top at the 11:00 and 5:00 positions. These are thrill rides where thrill-seeking people are thrilled by being thrillingly dangled over the edge of a very tall structure. For me -- not so thrilling. I am perfectly thrilled by standing on the ground and looking up. For an opposite perspective, check out this link to Google Maps. My picture is from the perspective of a guy on the ground shooting up at the sky. This one is from the perspective of a guy (satellite, guy, what's the difference?) shooting down. This gives you what could be the world's largest sun dial. Google Maps rocks! I figured that I would start off my blog with a picture of the whole family. Michael, Jackie, Steve, and Luke, left-to-right. 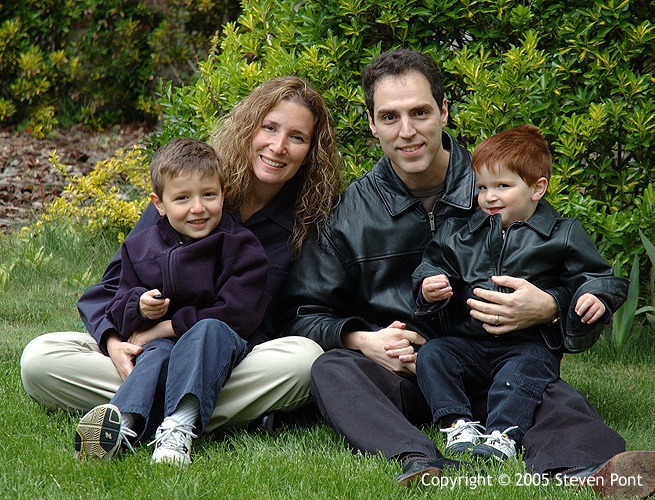 This was taken on Mother's Day, 2005. This may be the last picture you see of me since I am usually behind the camera.